How’s that? 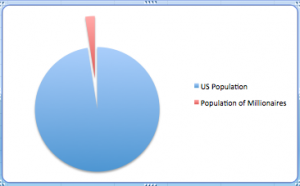 In 2010, there were 308,000,000 Americans in the United States. At that same time, there were 7,800,000 millionaires. Democrats (blue) are fighting for every single person in the United States. Republicans (red) are fighting ONLY FOR THE MILLIONAIRES. How else can you explain why Republicans are refusing to allow tax increases on millionaires? ← What Is Michele Bachmann Hiding?